On the second floor of what was once a school in east Mosul, an Iraqi Army medic stuck his chin out a hallway window and shaved over the courtyard. On either side of him in the dingy hallway light, detainees sat facing the wall, blankets cast over their heads. The Iraqi Army had brought them in on a tip from a man they caught with bomb making materials, and a U.S. Army platoon had just arrived. As the medic flicked his razor and turned his small mirror, the American soldiers stood the detainees up one by one, scanned their retinas, took their thumbprints, and photographed their faces. "We got a hit," exclaimed the soldier with the scanning device. "Be careful that this one cannot see the other when he stands," said the platoon's Kurdish translator, pointing to the detainee. "This is very important." Trust is a frequent topic of conversation here in Mosul. On February 24, men in Iraqi police uniforms opened fire on four of the American soldiers they were supposed to be working with, wounding them and killing their interpreter. This, however, was seen as an exception. From privates to colonels, U.S. soldiers agree that the Iraqi Security Forces have improved and try to trust them  though members of the national army significantly more than the local police. I was a little surprised to hear this from Col. Hazar. I had spent the day walking through the Colonel's area of operations, in the mixed Arab-Kurdish (though mostly Kurdish) towns of Karach and Machmour, south of Mosul. Everyone I spoke with who was even remotely connected to the military or government assured me, at least to start, that in these areas, Arabs and Kurds were like brothers and had lived together for hundreds of years. "The problems are government problems," said Saber Sharif Ahmed, a Kurdish primary school teacher, before introducing me to the local secondary school teacher, who was an Arab. "See? The school, the hospital, all is for both of us." But in almost every case, after talk of brotherhood came talk of war. Over tea in a small Iraqi Army station in Wana, a gray town on the northern outskirts of town, I watched Kurdish Peshmerga and U.S. Infantry officers discuss the continuing insurgency efforts with the Iraqi Army. "We are one army. But even if you gave millions of dollars to this area, there would still be problems here," said Walleed Rasheed, a member of the Peshmerga who identified himself simply as a soldier. "When the U.S. Army leaves this area, the terrorists will kill a lot of people." The officer sitting next to him, Capt. Afar, added, "We don't want the United States to leave." Across the city, none of the Kurds I spoke to want the Americans to leave. The type of people whom Rasheed and Capt. Afar told me they were worried about  Sunni Nationalists, members of the former regime, officers in the Iraqi Army  also told me that they and the Peshmerga are unified. "We are one army," Col. Ali of east Mosul's 1st Brigade told me. "But," he added, in contradiction, "the Pesh is a militia." A few days after the meeting in Wana, I attended the transfer of control over the Sons of Iraq  which was definitely a militia  from the U.S. to the Government of Iraq. 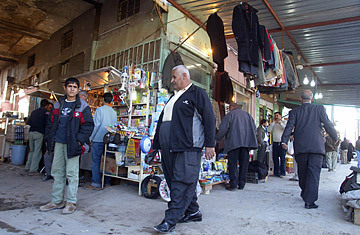 Many of the Sons of Iraq (SOI) were former Sunni fighters, drawn and brought into the fold after their alienation from the more radical elements of the insurgency. Their attending Major, Ibrahim Mohammed Abdullah, told me that "we are very happy that our good friends the Americans are leaving." All of these men, Peshmerga and the Sons of Iraq, the Kurds and Arabs alike, are technically members of the same national security force, with which the American military is trying to work closely. Back in the hallway with Ricky and the shaving medic, I thought about this as I interviewed an Arab soldier watching the proceedings. Pvt. Faisal told me that there would be no problems with the Kurds  "as long as they stayed in Kurdistan"  and that he was happy to see the U.S. leave. After that I was walking over to the medic to talk  he was done shaving  but Ricky stopped translating for the American soldiers and stood in my way. "He is a bad man. He stole a Playstation." Ricky referring to the private and nodding toward the Americans, "...from our soldiers. I do not trust him." Around us, the detainees continued to sit under their blankets. Ricky translated for me all day.